"Time's Up! 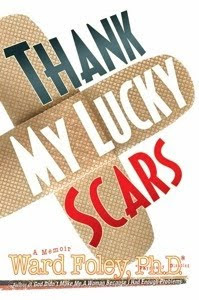 ": "Thank My Lucky Scars"
About a year ago I was on Facebook and one of those instant messages came up on the bottom of my screen. Rarely do I pay attention, for some unknown reason I hit the response button and typed "hello." The person at the other end of cyberspace was a man whom unknown to me at the time, literally, across the country, makes the journey with those in the final hours of their lives. He had a difficult time typing and asked if I would be alright with calling so we could talk on the phone. His voice sounded like a cross between singer Kris Kristofferson and Pastor Rick Warren, with the ease and wisdom that comes with being wiser beyond ones years. We laughed and talked for hours as though we were long lost friends. Ward was born with multiple birth defects and very little chance of survival. After decades of surgery, years of taunting by classmates, constant ridicule because he was different and humiliation by the outside world most us would not survive, Ward Foley is a remarkable life force like nothing I have ever encountered. Nearly seven days a week Ward Foley begins his day by touching the lives of those whom are in their last hours of life, or visiting a children's hospital talking with a parent or child after a difficult surgery to correct a limb or remove a life threatening tumor. Other days he can be found making the rounds in the hospice wing of hospitals or at the home of a person preparing to die. No matter how he is feeling or what is aching in his own body he journeys out that door because people are counting on him. He remains at the side of those whose families are either non-existent or have already passed on. Ward runs errands, (well he says he does but I know he cannot run as he often jokes) when a patient has a request he finds a way to make certain it happens. Or, in his arms, using his body as a kind of cushion, he holds that precious life up close into his body, gently telling a corny story or talking with them until they take their last breath. Sandy Kuhlman who is on the Board of Directors for the National Hospice & Palliative Care organization said " Ward has limitless wisdom, courage, warmth, and humor to share with those facing so many life's major transitions and hardships. Ward found a "life peace" most of us only dream or read about. His body is covered with scars and he realized that each "scar" was the one thing in his life that brought him closer to the people and experiences that helped others make important transitions in their lives. He does not know the meaning of the word "can't," in fact it's banned from his vocabulary except when he is giving one of his witty speeches. Ward Foley is also the author of the book "Thank My Lucky Stars" a book that once you read it you actually forget your own troubles. It is an amazingly inspiring book that will make you laugh (even when you don't feel like it) and for me that is a huge achievement. A portion of the proceeds are donated to Hospice. It's Ward's way of doing something indirectly for those he does not have the opportunity to meet or help with during end of life care. His previous book needs to be mentioned to let you know what kind of extraordinary man Ward Foley is. It's title is: "God Didn't Me Me A Woman Because I Had Enough Problems." He uses what others might view as an obstacle, providing human compassion, hope, love and laughter, spreading his message of "I can do anything" and so "can you" taking his scars that he wears on the outside and somehow shows us the importance of removing those we carry with us on the inside. Ward Foley is a blessing to so many-I am humbled to call him my friend! Have to agree with you on everything you have to say about Ward.....he is my first cousin and I remember being little at Gramdma Ward's house and never thinking he was different than the rest of the cousins. As I have grown older, I indeed truly appreciate the difference....if we could only be half the person he has become. We all need a dose of "feel good" warm and fuzzy I will be sure to pick up a copy of his book. Thank you for sharing this one, Susan. Through you Ward has brought laughter into my life today. And I seriously needed the smiles and real laughter (over the title of his book). And,too, I needed the reminder that no matter how bad my day is, others have those bad days worse than mine. He sounds like a truly amazing man. God knows we need more of them. I have a feeling though that none could equal him. I will check out his books. There is a tremendous and overwhelming flow of heart felt gratitude as I read about a man whose life shines for so many who must see as their soul prepares for home. Ward Foley is the true light on earth directing traffic for a safe journey home. I realized in reading this there are 2 people this story is about because I have a sense the author hersef carries the same light for traumatized families and her journey is also important to a story that could not have been written without flying with the identical angel wings as Ward.